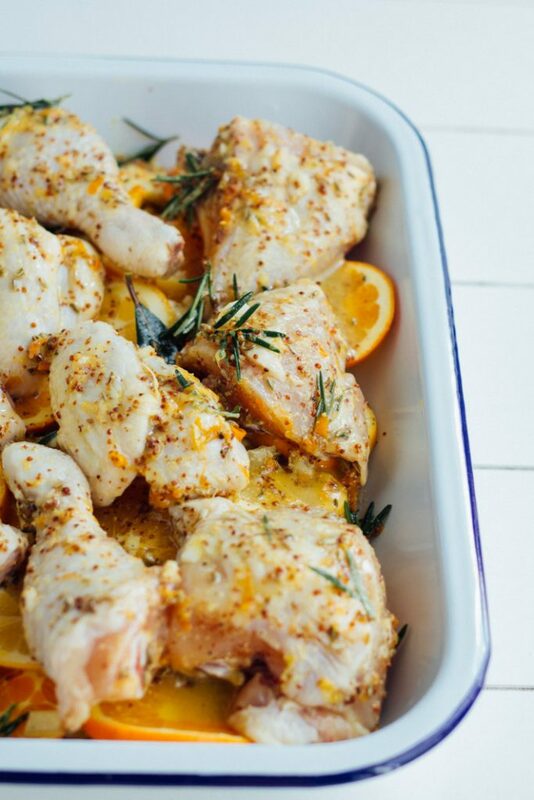 Chicken marinated in mustard, herbs and citrus then roasted on a bed of oranges, lemons and fennel. An easy and delicious one pan meal that is perfect for a weeknight dinner or for entertaining! Jump to recipe. Is there anyone out there who doesn’t love one pan meals? Seriously? Okay, anyone out there with a personal chef or full time dish washer may be wondering what the big deal is right now. I also question what you’re doing here at my blog, welcome anyway. For the rest of us regular chumps anything that makes our life easier and reduces clean up at the end of a long day is pretty awesome in our books, amiright?! 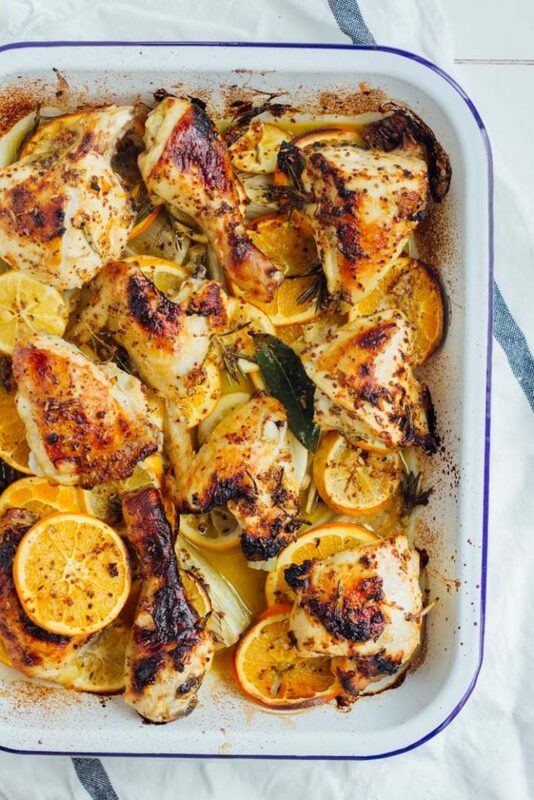 Hello Citrus, Fennel and Chicken Bake! One pan meal! In my previous life I was in the military. In case our plane should ever crash land (thankfully never happened, phew!) we were obligated to do survival training. It basically consisted of a couple of (really fun…notice the sarcasm there) weeks where we were left in the bush and out at sea on a life raft to survive and like the TV show, we we given almost no food. I lost 10 percent of my body weight in those two weeks! I also became best friends with a little weta who lived by my self-made shelter. Now I say that we were given almost no food because we were given a delightful surprise half way through the training – three rather scrawny looking chickens. Now I have never killed an animal, I volunteered at the SPCA and have trouble with the concept of catching that darn mouse that keeps making it’s way back under my fridge all the time. So I really wasn’t relishing the idea of killing these chickens which I admit is very gutless of me considering I am happy to eat chicken on a regular basis. Luckily some brave soul in our group did the deed and then I sat there plucking these semi-warm chickens for a good hour. I really didn’t anticipate how long it would take to pluck a chicken! The scrawny chicken really tasted quite horrible, but we were all so hungry that we sucked all those bones clean! For literally months after the training I couldn’t touch chicken. I obviously have gone back to eating it again now but the experience really made me more aware of where my food comes from. I always knew but to actually see an animal sacrificing it’s life to feed you really makes you appreciate the food you are given. Since then I only buy free range chicken so that I know the animal had a good life, plus I think it tastes better! I also mainly buy chicken thighs and the less popular cuts of meat in a hope that it means less of the animal is wasted (chicken liver pate anyone?). I get it, I know it’s expensive and I know I’m privileged to be able to afford it but I am happy to eat less chicken and more veggies or other cheaper food to know that the animal had a good life…helps me sleep better at night! One of the best ways to save some money in the chicken department is to portion up a chicken yourself. With two measly chicken breasts costing the same as a whole chicken, it makes sense to buy the whole bird. Teach yourself to portion it up into eight or ten pieces (cut off the wings for this) or just ask you kind butcher to do it for you and you’ll get a whole lot more chicken for your money! Also means you can rest well that night knowing that less of the bird went to waste. 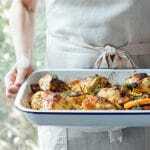 My Citrus, Fennel and Chicken Bake is a great way to use a whole chicken in this way. Keeping the skin on and bone in gives it so much flavour and keeps the chicken perfectly tender. 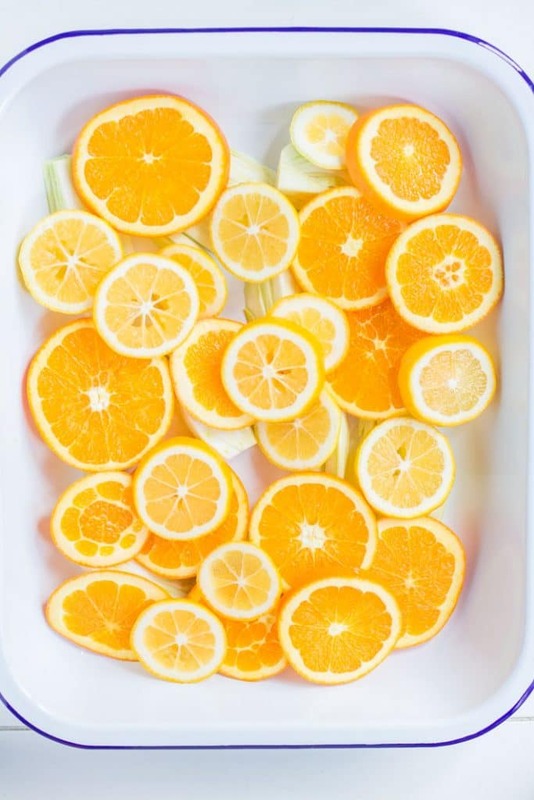 The chicken is marinated in a citrusy-mustardy-herby-marinade then roasted on a bed of oranges, lemons and fennel bulbs. 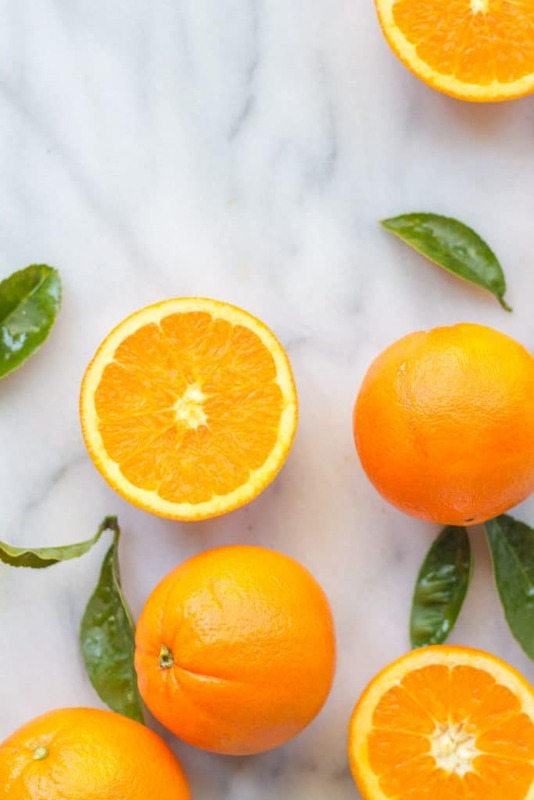 The orange and lemon flesh is obviously delicious to eat but some of the rinds become caramelised and so delicious to eat too – my favourite part of the dish! Actually, the best part is that the whole thing is cooked in just one pan! Yes, can you say easy clean up! 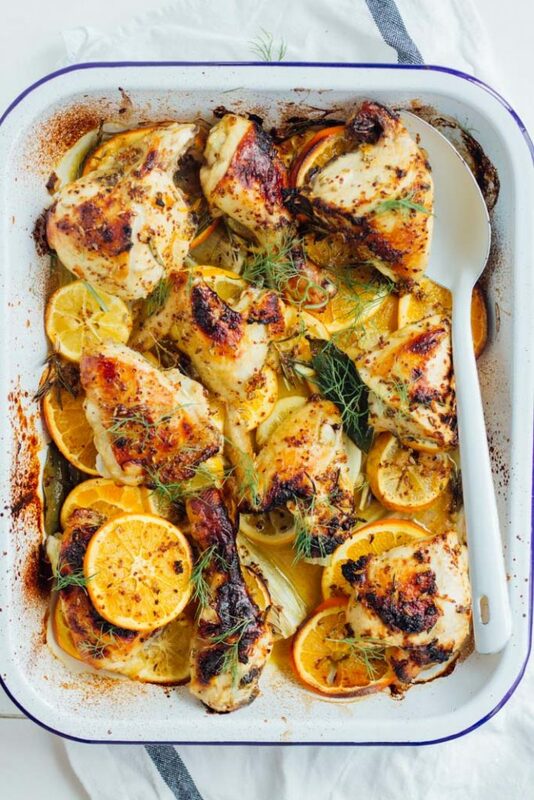 Chicken marinated in mustard, herbs and citrus then roasted on a bed of oranges, lemons and fennel. An easy and delicious one pan meal that is perfect for a weeknight dinner or for entertaining! 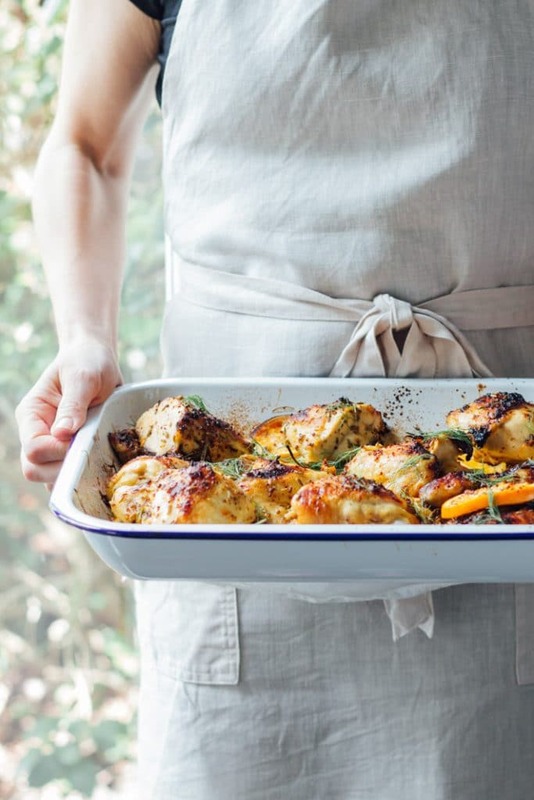 Place chicken in a large bowl (or baking dish). In a small bowl mix together the olive oil, mustard, sugar, lemon zest and juice, rosemary, fennel seeds, salt and pepper. Pour marinade over chicken, tuck in bay leaves, cover and leave to marinate in the fridge for at least 2 hours or overnight. When ready to bake, preheat oven to 200C/400F fan-bake. 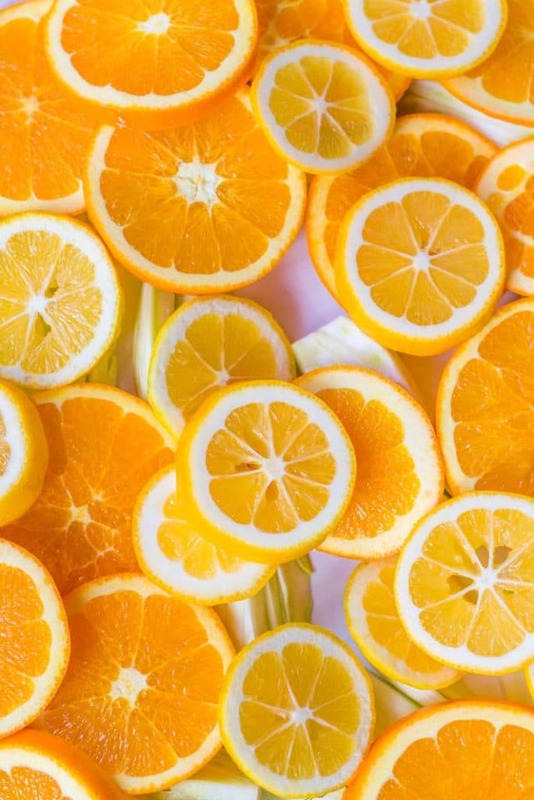 Scatter sliced lemons and oranges, preserved lemon and fennel bulbs over a baking dish. Arrange the chicken pieces on top, the larger pieces nearer the outside and tuck the end of the wings under to stop them burning. Pour over marinade and white wine and sprinkle a little extra olive oil, sea salt and cracked pepper over the chicken pieces. Tightly cover with foil and bake for 20 min. Remove foil and bake uncovered for around 20-30 min or until the chicken has browned and cooked all the way through. Scatter over some reserved fennel fronds and serve alongside rice or mashed potato and a green salad. 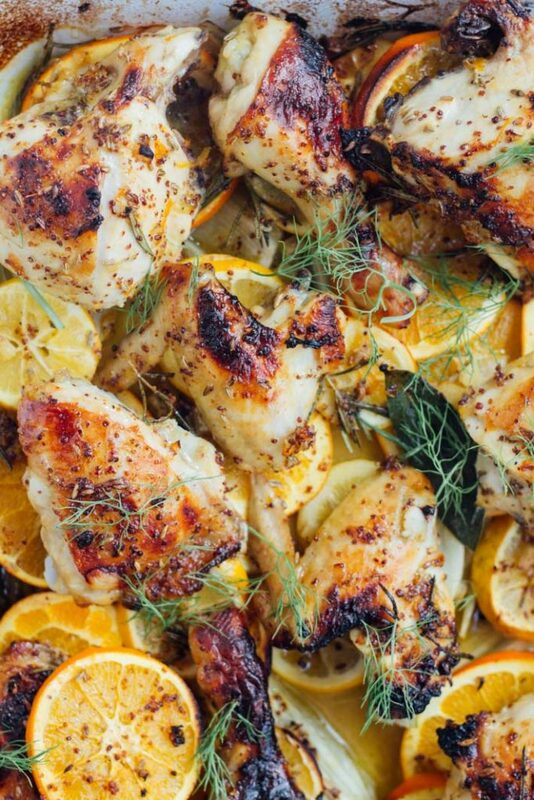 I can imagine how good this chicken would taste like with citrus and fennel! Especially when the citrus becomes caramelised so it’s less tangy and the chicken flavour blends with it. Yummm! You are so eloquent and have such a wonderful way of describing food! Thanks for your lovely (and beautifully descriptive) comment! This looks wonderful! Love chicken bakes. Thanks so much Natasha! I’m a big fan too, especially anything that only uses one pan.